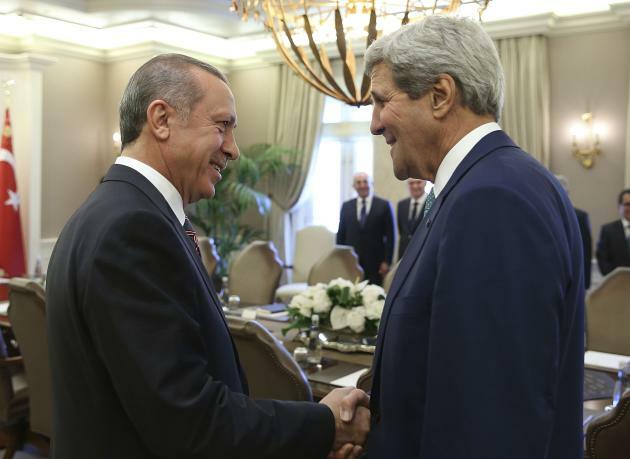 U.S. Secretary of State John Kerry and Turkey's President Tayyip Erdogan at a meeting in Ankara. But his decision not to decide remains puzzling. There is little question that the Turkish armed force, which is the strongest Islamic-Muslim military in the region, had the capability to destroy the Syrian military. To be sure, the Syrian army has proved to be tough, loyal, and effective in its own right, essentially winning the war against the eclectic groups of “moderate” rebels – and now is contending more-or-less successfully against ISIS. Nevertheless, after more than 50 years as a NATO member, the Turks are equipped and trained to NATO standards, and the Turkish army has a long-standing reputation for being tough, proficient fighters. The Kurds. The answer to the Turkish conundrum is multifaceted. Erdogan’s grip on the military is not as ironclad as was his predecessors’. His effort to nudge Turkey toward becoming a religious state and away from its century-long, Ataturk-directed secular status continues to meet resistance. And addressing the Kurds’ status in Turkey has bedeviled him as much as it frustrated other Turkish leaders. Essentially, the Kurds are a people without a country. And they want, indeed demand, one: a “Kurdistan” assembling all of their people. The key difficulty is that the Kurds are all over the map: elements in Syria, Iraq, Iran and Turkey where, for over a generation, Kurdish groups (and they certainly qualify also as terrorists in the sense that “one man’s terrorist is another man’s freedom fighter”) have fought for independence. Attempting to square the circle of providing Kurds something equivalent to local autonomy within a Turkish socio-political framework has proved feckless. There is a long history of heavy-handed Turkish action (and when are Turks light-handed?) suppressing Kurdish language, culture, and political activity. And Turkish Kurds, estimated at 16-23 million (upwards of 25 percent of the population), are the largest Kurdish contingent in the region and hardly a trivial minority. And ISIS. The failure to act expeditiously in Syria (by the entire non-Syrian community) resulted in a maelstrom of mutual slaughter and atrocity. Currently, there are two essential actors: the Assad government and the Islamic State of Iraq and Syria (ISIS). One must discount the “moderate” Islamics, who proved fecklessly disorganized. ISIS, a terrorist movement that swept away the Iraqi army and now stands outside Baghdad, has also seized much of eastern Syria. Finally, at Kobani at least, the tide has turned. Steady streams of U.S. combat sorties has disrupted ISIS attacks and C-130 airdrops have somewhat replenished the Kurdish defenders. Erdogan has been infuriatingly ambivalent about permitting Kurdish forces to transit Turkey to reinforce Kobani, but lately has made nice-nice noises about co-operating with the U.S. government against ISIS. Tramp, Tramp, Tramp, the Boys Are Marching. The stand at Kobani ultimately may prove, to recall a phrase, “the end of the beginning.” But elsewhere, notably in Iraq, ISIS surges. The shattered Iraqi army is proving as difficult to reconstitute as a porcelain figurine dropped from a 10-storey building. ISIS is learning also – its forces are no longer spread across the desert like target practice models but now snuggle into civilian buildings to disperse. Smart bombs kill them, but civilian casualties also rise. Still the whisper stream suggests more help is on the way: Apache helicopter gunships more adroit at winkling out such targets. And elements of the lst Infantry Division headquarters are on their way to Baghdad – perhaps a precursor for combat battalions. History has shown we can rebuild an army – we did so with the Korean War ROK army – but we must stand with them. David T. Jones is a retired State Department Senior Foreign Service Career Officer who has published several hundred books, articles, columns, and reviews on U.S. - Canadian bilateral issues and general foreign policy. During a career that spanned over 30 years, he concentrated on politico-military issues, serving as advisor for two Army Chiefs of Staff. He has just published Alternative North Americas: What Canada and the United States Can Learn from Each Other.